This raw salad is economically sound as it requires no electricity nor gas to prepare. It’s wonderful for your gut health too! It’s packed with essential vitamins and nutrients. Place the vermicelli into a bowl and cover with water, allow the noodles to stand for 15-20 minutes and then drain the water from the noodles once they are soft. Using a vegetable peeler, cut the carrots into thin ribbon strips. 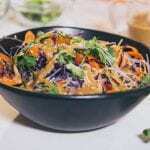 Place the carrot ribbons, spring onion, vermicelli, cabbage, edamame beans and coriander into a serving bowl. Add the satay sauce and toss well to coat all the ingredients, then top with toasted sesame seeds.